Yahoo! 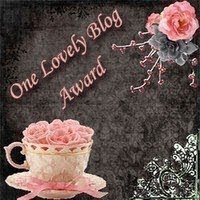 Natalie Murphy AND Stephanie McGee both gave me the One Lovely Blog Award! 2. Contact the bloggers to let them know they've been chosen. Numbers have never been my strong point, but here are my nominees! Also... In my excitement about Egyptian toys, I forgot this weekend's word game. But I think it works for Monday too- I know I need all the help I can get making Monday's bearable. My sentence: I will extirpate every gray hair on my head, including the one eyebrow hair that keeps growing back.